You should read enough of the materials presented in this section concerning the tradition of Buddhism in order to understand how this tradition displays the characteristics or elements that make a tradition one that would be termed a “religion. The tradition presented in the materials below is one of the world’s living religions. You reading should indicate why this is so. Buddhism evolved in India. There were periods in India's past when Buddhism was dominant in India. Today less then 1% of India's population is Buddhist. Buddhism has more followers in countries east of India. Buddhism was established in about 500 BC. Buddhism began with a prince called Siddhartha Gautama. 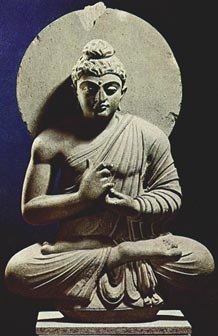 Siddhartha belonged to an aristocratic family. As a prince he had lot of wealth. He never left his palace. At some point Siddharta began to leave his palace and behold for the first time poverty, sickness and misery. After seeing this Siddharta lost interest in his spoiled life and left his palace forever and gave his rich personal belongings to the needy. He joined a group of ascetics who were searching for enlightenment. In those days people searching for enlightenment believed that this could be gained only by people who were capable of resisting their basic needs. These people almost did not eat anything and almost starved themselves to death. Siddharta also adopted this path of searching enlightenment. But at some point he came to a conclusion that this was neither the way towards enlightenment nor the spoiled life he had as a prince was the right path towards enlightenment. According to him the right path was somewhere in the middle and he called it the 'middle path'. In order to focus on his enlightenment search, Buddha sat under a fig tree and after fighting many temptations he got his enlightenment. In his region 'enlightened' people were called Buddha. And so Siddharta was named Buddha. According to Buddha's theory life is a long suffering. The suffering is caused because of the passions people desire to accomplish. The more one desires and the less he accomplishes the more he suffers. People who do not accomplish their desirable passions in their lives will be born again to this life circle which is full of suffering and so will distant themselves from the world of no suffering - Nirvana. To get Nirvana, one has to follow the eight-fold path which are to believe right, desire right, think right, live right, do the right efforts, think the right thoughts, behave right and to do the right meditation. Buddhism emphasis non- violence. Buddha attacked the Brahmanic custom of animal slaughtering during religious ceremonies. Religiously the Buddhists are vegetarians. But many Indians believe that Buddha, died because he ate a sick animal. Buddhism does not have a God. But many Buddhists keep images of Buddha. Buddha is not seen as the first prophet of the religion, but as the fourth prophet of the religion. There are two main doctrines in Buddhism, Mahayana and Hinayana. Mahayana Buddhist believe that the right path of a follower will lead to the redemption of all human beings. The Hinayana believe that each person is responsible for his own fate. Along with these doctrines there are other Buddhist beliefs like 'Zen Buddhism' from Japan and the 'Hindu Tantric Buddhism' from Tibet. Zen Buddhism is a mixture of Buddhism as it arrived from India to Japan and original Japanese beliefs. The Hindu Tantric Buddhism is a mixture of Indian Buddhism and original Tibetian beliefs which existed among the Tibetians before the arrival of Buddhism in Tibet, among it magic, ghosts and tantras (meaningless mystical sentences). Originating as a monastic movement within the dominant Brahman tradition of the day, Buddhism quickly developed in a distinctive direction. The Buddha not only rejected significant aspects of Hindu philosophy, but also challenged the authority of the priesthood, denied the validity of the Vedic scriptures, and rejected the sacrificial cult based on them. Moreover, he opened his movement to members of all castes, denying that a person's spiritual worth is a matter of birth. See Hinduism. Buddhism analyzes human existence as made up of five aggregates or "bundles" (skandhas): the material body, feelings, perceptions, predispositions or karmic tendencies, and consciousness. A person is only a temporary combination of these aggregates, which are subject to continual change. No one remains the same for any two consecutive moments. Buddhists deny that the aggregates individually or in combination may be considered a permanent, independently existing self or soul (atman). Indeed, they regard it as a mistake to conceive of any lasting unity behind the elements that constitute an individual. The Buddha held that belief in such a self results in egoism, craving, and hence in suffering. Thus he taught the doctrine of anatman, or the denial of a permanent soul. He felt that all existence is characterized by the three marks of anatman (no soul), anitya (impermanence), and dukkha (suffering). 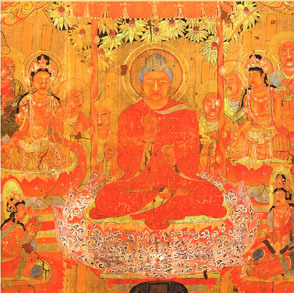 The doctrine of anatman made it necessary for the Buddha to reinterpret the Indian idea of repeated rebirth in the cycle of phenomenal existence known as samsara. To this end he taught the doctrine of pratityasamutpada, or dependent origination. This 12-linked chain of causation shows how ignorance in a previous life creates the tendency for a combination of aggregates to develop. These in turn cause the mind and senses to operate. Sensations result, which lead to craving and a clinging to existence. This condition triggers the process of becoming once again, producing a renewed cycle of birth, old age, and death. Through this causal chain a connection is made between one life and the next. What is posited is a stream of renewed existences, rather than a permanent being that moves from life to life—in effect a belief in rebirth without transmigration. The ethic that leads to nirvana is detached and inner-oriented. It involves cultivating four virtuous attitudes, known as the Palaces of Brahma: loving-kindness, compassion, sympathetic joy, and equanimity. The ethic that leads to better rebirth, however, is centered on fulfilling one's duties to society. It involves acts of charity, especially support of the sangha, as well as observance of the five precepts that constitute the basic moral code of Buddhism. The precepts prohibit killing, stealing, harmful language, sexual misbehavior, and the use of intoxicants. By observing these precepts, the three roots of evil—lust, hatred, and delusion—may be overcome. About a century later, a second great council is said to have met at Vaishali. Its purpose was to deal with ten questionable monastic practices—the use of money, the drinking of palm wine, and other irregularities—of monks from the Vajjian Confederacy; the council declared these practices unlawful. Some scholars trace the origins of the first major split in Buddhism to this event, holding that the accounts of the council refer to the schism between the Mahasanghikas, or Great Assembly, and the stricter Sthaviras, or Elders. More likely, however, the split between these two groups became formalized at another meeting held some 37 years later as a result of the continued growth of tensions within the sangha over disciplinary issues, the role of the laity, and the nature of the arhat. The third council at Pataliputra (present-day Patna) was called by King Ashoka in the 3rd century BC. Convened by the monk Moggaliputta Tissa, it was held in order to purify the sangha of the large number of false monks and heretics who had joined the order because of its royal patronage. This council refuted the offending viewpoints and expelled those who held them. In the process, the compilation of the Buddhist scriptures (Tipitaka) was supposedly completed, with the addition of a body of subtle philosophy (abhidharma) to the doctrine (dharma) and monastic discipline (vinaya) that had been recited at the first council. Another result of the third council was the dispatch of missionaries to various countries. A fourth council, under the patronage of King Kanishka, was held about AD 100 at Jalandhar or in Kashmir. Both branches of Buddhism may have participated in this council, which aimed at creating peace among the various sects, but Theravada Buddhists refuse to recognize its authenticity. The Sutta Pitaka is primarily composed of dialogues between the Buddha and other people. 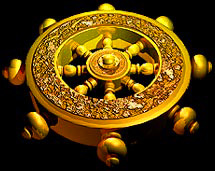 It consists of five groups of texts: Digha Nikaya (Collection of Long Discourses), Majjhima Nikaya (Collection of Medium-Length Discourses), Samyutta Nikaya (Collection of Grouped Discourses), Anguttara Nikaya (Collection of Discourses on Numbered Topics), and Khuddaka Nikaya (Collection of Miscellaneous Texts). In the fifth group, the Jatakas, comprising stories of former lives of the Buddha, and the Dhammapada (Religious Sentences), a summary of the Buddha's teachings on mental discipline and morality, are especially popular. Another important new concept in Mahayana is that of the bodhisattva or enlightenment being, as the ideal toward which the good Buddhist should aspire. A bodhisattva is an individual who has attained perfect enlightenment but delays entry into final nirvana in order to make possible the salvation of all other sentient beings. The bodhisattva transfers merit built up over many lifetimes to less fortunate creatures. The key attributes of this social saint are compassion and loving-kindness. For this reason Mahayana considers the bodhisattva superior to the arhats who represent the ideal of Theravada. Certain bodhisattvas, such as Maitreya, who represents the Buddha's loving-kindness, and Avalokitesvara or Guanyin, who represents his compassion, have become the focus of popular devotional worship in Mahayana. King Ashoka's son Mahinda and daughter Sanghamitta are credited with the conversion of Sri Lanka. From the beginning of its history there, Theravada was the state religion of Sri Lanka. About the beginning of the Christian era, Buddhism was carried to Central Asia. From there it entered China along the trade routes by the early 1st century AD. Although opposed by the Confucian orthodoxy and subject to periods of persecution in 446, 574-77, and 845, Buddhism was able to take root, influencing Chinese culture and, in turn, adapting itself to Chinese ways. The major influence of Chinese Buddhism ended with the great persecution of 845, although the meditative Zen, or Ch'an (from Sanskrit dhyana,"meditation"), sect and the devotional Pure Land sect continued to be important. Buddhism was carried into Japan from Korea. It was known to the Japanese earlier, but the official date for its introduction is usually given as AD 552. It was proclaimed the state religion of Japan in 594 by Prince Shotoku. Zen advocated the practice of meditation as the way to a sudden, intuitive realization of one's inner Buddha nature. Founded by the Indian monk Bodhidharma, who arrived in China in 520, Zen emphasizes practice and personal enlightenment rather than doctrine or the study of scripture.See Zen.